“Enough moisture, but it feels dry” Supporting your moisture and barrier effect. Q1 What is the concept? A1 It is “availability” and “effect”. For you to keep using this product, we produce effective cream while we value the point of availability. This cream has born with such the concept. Q2 What is the specific about availability? A2 Enough moisture, even though it feels dry. It does not become clammy and has good extension. Q3 Is there any point we should take care of or knack to use? A3 It is important not to rub the cream into skin when you apply it. You may feel it is not enough only to apply Itchnon AD cream in the case you have heavy dry skin or you cannot have time to apply it for a while such as sleeping time. Only in the case, we recommend you to apply additional cream such as white vaseline after you have applied Itchnon AD cream. This product is infinitesimally low irritating, but in the case you feel tingling ache in skin, we recommend you to stop using temporarily, and to start using it again after several days. This is moisturizing cream we want to recommend so called who has dry skin (such as sensitive skin or atopic dermatitis). Q4 What is the most different point between usual moisturizing cream and this product? A4 When we talk about moisture of skin, it is thought that the combination of oil-based moisturizing ingredients and hydrophilic moisturizing ingredients. We stick to the combination for this Itchnon AD cream and design its ideal composition and concentration. This cream is to support your barrier function and skin function. Also you can realize the difference when you keep using it. Q5 What is the superior point of Itchnon AD cream? A5 It is the ingredients themselves. We do not use trendy ingredients, its appearance or advertisement. You can realize that it is good product by using it. We considered its moisturizing ingredients and we dispense the balanced ingredients which are technically perfect concentration as possible to bring out its effect. Q6 Is it OK to use as makeup base? A6 Absolutely OK. In particular, although it looks fine skin on the surface, it can be under the situation of dry skin with low barrier function. This is the best way to care sensitive skin. Dry is the formidable thing for the skin. Therefore, you need moisturizing measures. Please give your skin enough moisture with this Itchnon AD cream. As Itchnon AD cream has light texture, you can use in summer time. We recommend this to men to use as skin care after shaving. Q7 Is it better not to apply it in case I have pimples? A7 No. Pimples are considered one of the phenomenons of sensitive skin. The problem of the stratum corneum brings out such situation. Itchnon AD cream has enough ingredients which work on such stratum comeum, and fill a gap between stratum cells. The cells are closely related to barrier function of stratum comeum. After washing face, apply it every day. Q8 My skin starts falling in drops when I keep using it. Should I stop using it? A8 Especially for who has heavy dry skin and much less barrier function for skin, they have wrong turnover for skin cells (skin changes by metabolism). Moreover, their stratum comeum are losing their precise structure. When such skin is going to change, you may see such phenomenon transiently like dried outmost stratum cells fall in drops. If you do not have itching, sensations of burning, or redness, please look at as transient pass point while you keep using it. Q9 Does it have antipruritic efficacy? A9 No. It does not have direct antipruritic efficacy as there is not antipruritic ingredients. 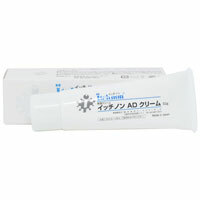 Itchnon AD cream is moisturizing cream specific about barrier function. In the case dry skin causes itching, it is surely considered that it will decrease itching with the increased capability of moisture. In any case, we recommend you to get a diagnosis by specialist and to take antihistamine medicine by mouth at the same time, in case you have skin trouble which cannot help but scratching. Scratching act strips skin barrier membrane off by the root. The nerves in dermis are exposed and it becomes easier to feel itching than before. It calls “itch-scratch-cycle”. In that case you have itching with scratching act, some mesures are needed to apply such as using antipruritic medicine.